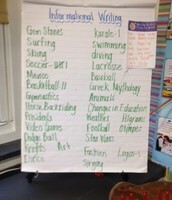 Brainstorming for our next writing unit. Thank you to Dr. Davidson for visiting us, taking time to make Latkes, and picking out a fabulous story! 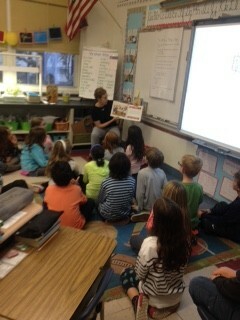 We read an informational text called What Do Illustrators Do? This text was illustrated and written by Eileen Christelow. During whole and small group instruction we worked on identifying text/graphic features that helped us understand the story. We completed written responses based on the text/graphic features. In addition, we practiced the strategy analyze and evaluate. We analyzed and evaluated many of the choices Ms. Christelow made for her book. This week we worked on reading, writing, and identifying place value for whole numbers and decimals. We also completed a practice test, stations, and completed the Unit 5 Math assessment. Please sign and return the Unit 5 Math assessment that is coming home tomorrow. The next unit we will work on is Unit 4. We began publishing our stories using Google Slides. 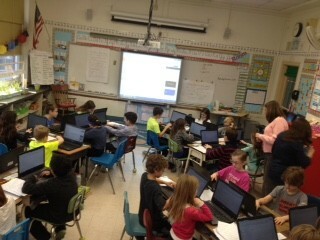 The students were thrilled to use the laptops to publish their writing! 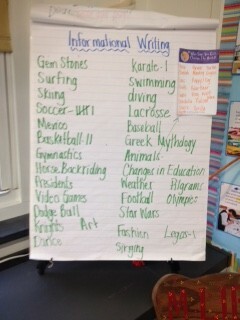 Upcoming in Writing: The next unit of study is Informational Writing. In an effort to help students prepare for this unit, please start brainstorming/discussing with your child about something he/she knows a lot about. They can check out books at the school or public library, watch videos, surf the internet (with your approval) to find out more information about their topic. Mrs. Miller is aware of the upcoming unit and will start pulling books, but I wanted you to be aware since things become busy around the holidays! The next Word Study Assessment will be on Tuesday, December 8th (Day 6). We learned about the anatomy of a flower. We labeled and color coded each part of a diagram. We began preparing for Student Lead Conferences. This week, we reflected on our social skills and completed a personal goal sheet. We learned the cursive t.
We reviewed articles (a, an) and comparing adjectives (-er, -est). Conferences: Please click the link to sign up for a conference if you have not done so already. Absences/Late: Always include csattendanceoffice@haddonfield.k12.nj.us on all emails regarding absence, early dismissal or late arrival. This email is checked frequently throughout the day. Vocabulary: Vocabulary for each story in Journeys can be found on my eBoard under the Language Arts tab. The red tabs are sectioned by lesson (example: L1 is Lesson 1 etc.). Vocabulary can also be found in the Journeys textbook or online textbook (before the reading selection). Strings Make Up Work: Please keep in mind that your child will be missing instructional time when he or she attends strings. Any work that he or she miss will be expected to be made up. Birthdays: If your child would like to celebrate his/her birthday, please contact me so we can set up a date to celebrate! See my eBoard for more details. Student Logins: If students forget their Journeys Textbook click this link for the website. Students have logins and passwords in the front of their Agendas. EDM Home Links can be accessed on the website. The login information is also in the front of your child's planner book. My eBoard has additional information on logging in under the Language Arts and Math tabs. 1.Typing Agent: **This is a GREAT tool to help your child with his/her typing skills! The link can be found on my eBoard under the PARCC/Teach tab. 4. Time for Kids is great for current events. 5. Online Addition Practice: **look on right hand side and click addition! 6. Moby Max: This is a great enrichment tool for Math and Language Arts. Your child's login is in the front of his/her planner. Students should have a good idea of how to log into this program. Please help us support Student Council by participating in the newest activity. NEW, unwrapped toys for kids. Especially, legos, Star Wars, barbies, dolls or sports equipment! Our goal is for every student in Central School to bring in one toy! Anything more is GREATLY appreciated!! December 1st through December 18th! Toys will be donated to local families who are in need of some extra special cheer over the holidays. Student Council representatives will come around on Tuesday and Thursday mornings to collect any toys that have been donated. Please TRY to remember the less fortunate during this holiday season. Thank you from the Student Council!! Thank you to all of the Room Moms and parents who took the time to help prepare for the Halloween Party. The games/activities, food, and drinks were perfect for the party. It was a blast!